Sometimes the early quick sketch or design study turns out better than the final art! 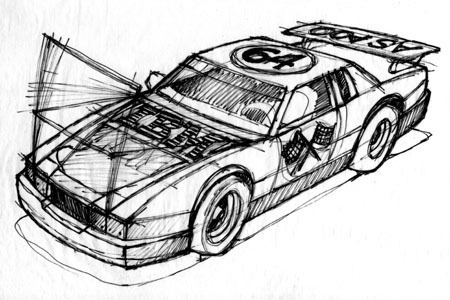 This pencil sketch was done by Randal in preparation for an illustration for an IBM publication that featured information about the company’s AS400 product line. The number “64” on the roof also had significance because the AS400 was being offered in a 64-bit model. Of course this makes the computer faster… hence the race car theme. The quick loose lines and conceptual working out of the idea has a certain quality that is lost in many final illustrations. This was done with pencil on tracing paper. I always preferred this sketch version over the final pen and ink art!